Well one thing's for sure, this is going to be the scariest Halloween ever. 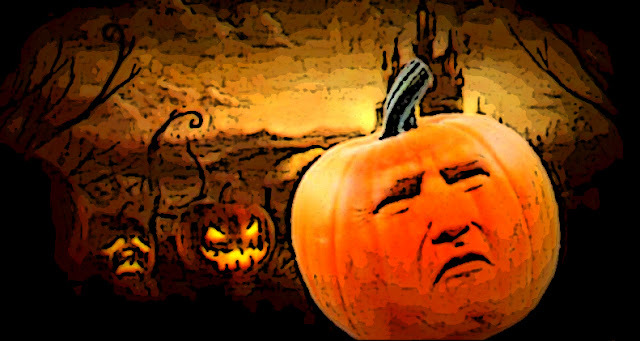 What with the monstrous Trumpkin scaring the bejesus out of kids and adults alike. But sadly, I don't think I'll be joining in the festivities. About four years ago I made three political wishes. 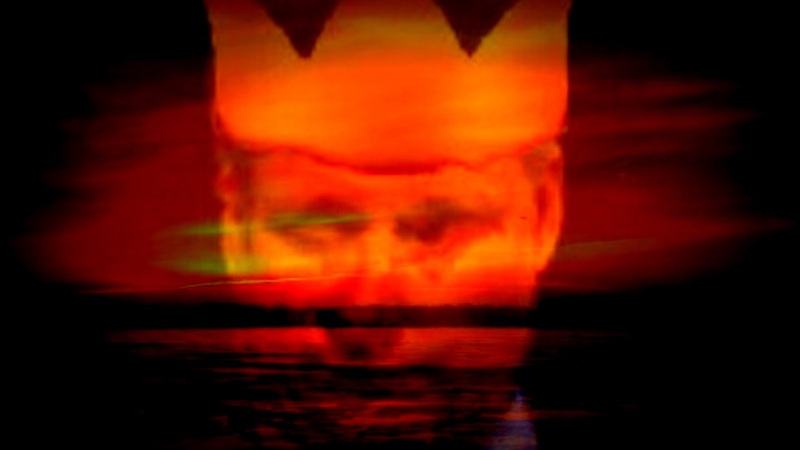 The first one was that Stephen Harper and foul regime be totally destroyed. And that one was granted. My second wish was that the Republican Party suffer the same fate. And whoever wins the U.S. election that also seems likely to be granted. 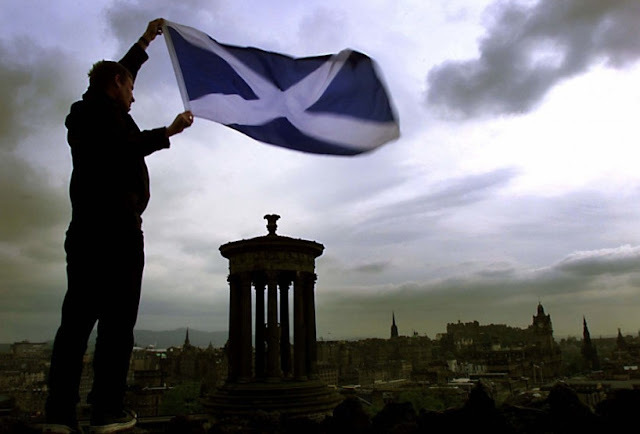 Which leaves me with my third wish, the independence of Scotland. 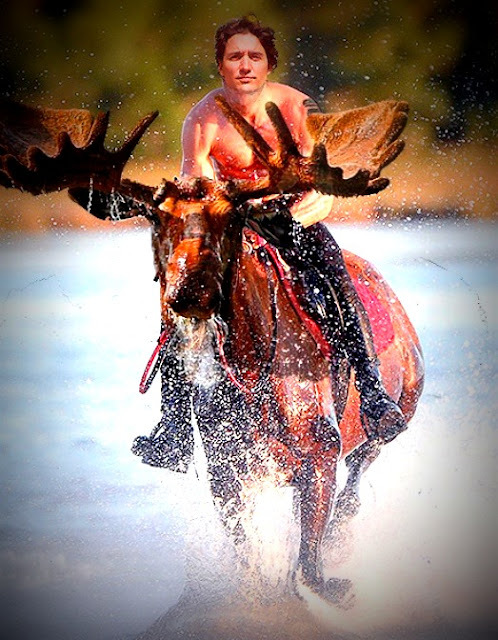 As I'm sure you know, I'm really enjoying living in Justin Trudeau's Canada, and of course the land of the noble moose. And I'm constantly battling with Cons and other grumpy old Trudeau haters who would try to tear it down, or make it something ugly, or all about pipelines and trade deals. Or poison us with their pessimism, and try to make Canada again a place where hope goes to die. So I'm happy to explain the progress of this country in three magazine covers and two moose. OK. Now it really is a horror show, and a living nightmare, just as I predicted. With only ten days to go before the American election, and Donald Trump closing in on Hillary Clinton. Clinton gets mugged by the FBI, dragged into another episode of her never ending e-mail scandal. I must admit I'm not quite sure how this zombie horror show is going to end. But I'm pretty sure that the final episode of this nightmare season is going to be one of the scariest nights of our lives. Because forget the new season of The Walking Dead, this is terrifying. Not because I don't believe Hillary Clinton will beat Donald Trump. But because I fear that a close result could lead to catastrophe. I have to admit it was a great photo-op, and a sure way to get the attention of the Con media. A small group of demonstrators at the CLC's Young Workers Summit turning their backs on Justin Trudeau. "Honour your promises!" hollered some in the crowd, as event moderators tried to keep the peace. "We don't have dialogue with liars!" "Shame! Shame!" While shooting selfies of themselves, with Justin peering over their shoulders. 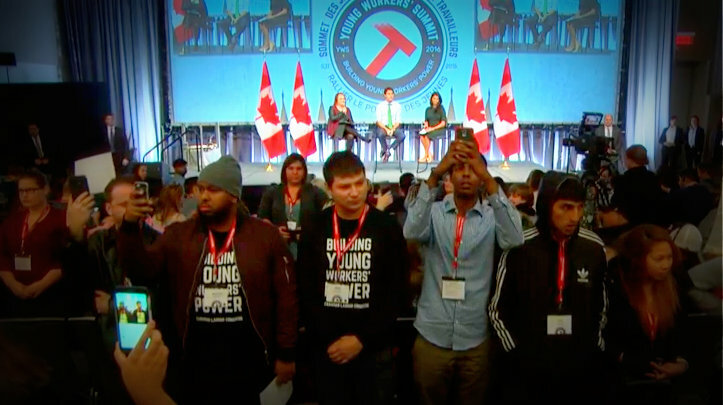 But although I am all in favour of young Canadians getting politically involved, and if necessary giving the Prime Minister a rough ride. I thought their behaviour was appalling. 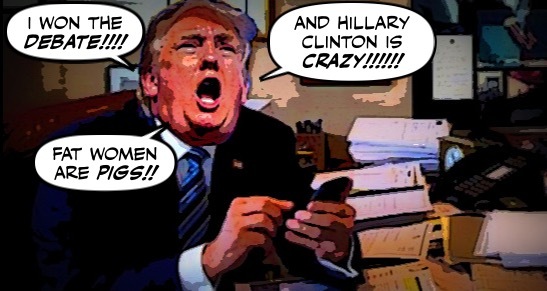 As we all know, it's sometimes hard to tell whether Donald Trump is an extreme narcissist, or a clinical psychopath, or a sexual predator, or a raging maniac. 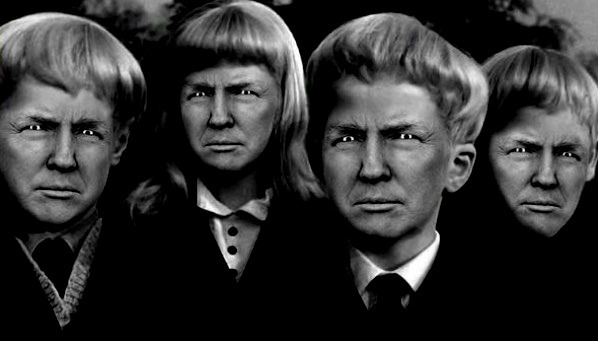 But now we find out that on a rare occasion when Trump revealed his inner demons, they turned out to be more pathetic than frightening. I love the musical Les Miserables. 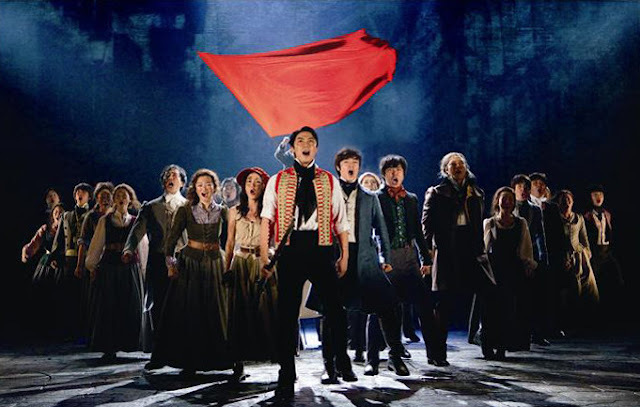 I love the songs, and the way the characters celebrate revolution. Even if it ends badly. 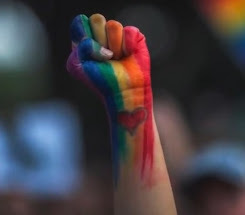 Because I believe that only a revolution can save us and the world we live in. 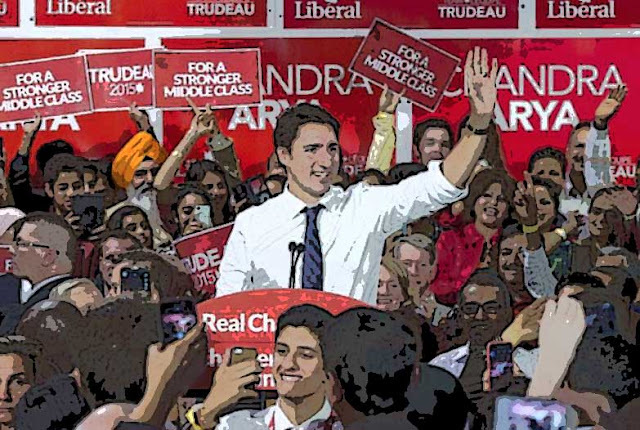 Is the Harper Party Becoming the Trump Party? 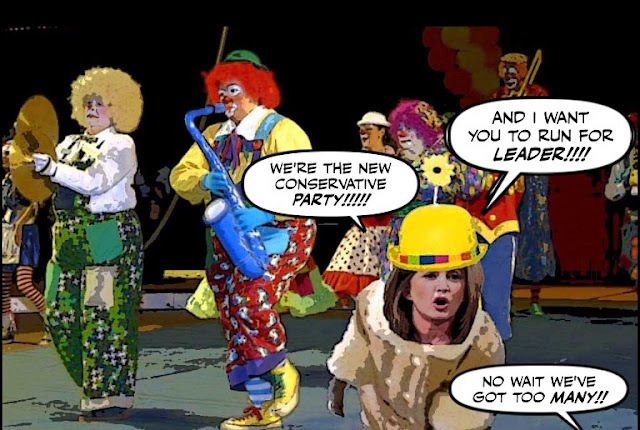 As you know I always predicted that the Con leadership race was going to be a real circus. But who knew there would be so many candidates? Twelve and counting. Or that it would be such a fascist circus. For look who just joined the race. With only fifteen days to go before the U.S. election, if we were on a plane this would be about the time when the pilot announces "we're now on final approach." 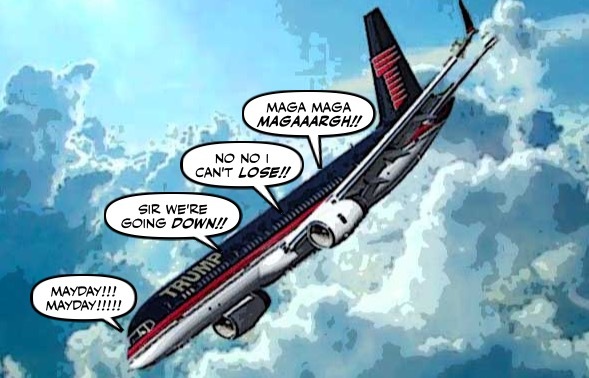 Or if you're on the Trump plane the pilot screams "Mayday!! Mayday!! Only God can save us!!!! Hillary Clinton has vaulted to a double-digit advantage in the inaugural ABC News 2016 election tracking poll, boosted by broad disapproval of Donald Trump on two controversial issues: His treatment of women and his reluctance to endorse the election’s legitimacy. Unless you're Donald Trump of course, who is still screaming "MAGA!!! MAGA!!! My campaign is not nosediving!!!!" It's a strange thing about Justin Trudeau. 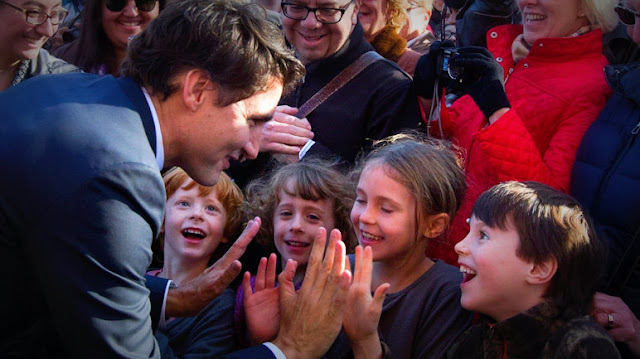 He may be the most popular Prime Minister in recent Canadian history, and a nice guy. But nobody is hated and demonized by some Canadians as much as he is, and now that hatred is out of control. For what else can explain that some crazy from the Green Party should throw pumpkin seeds at Trudeau. There are now only sixteen days to go before the U.S. election, but they promise to be some of the scariest days of our lives. 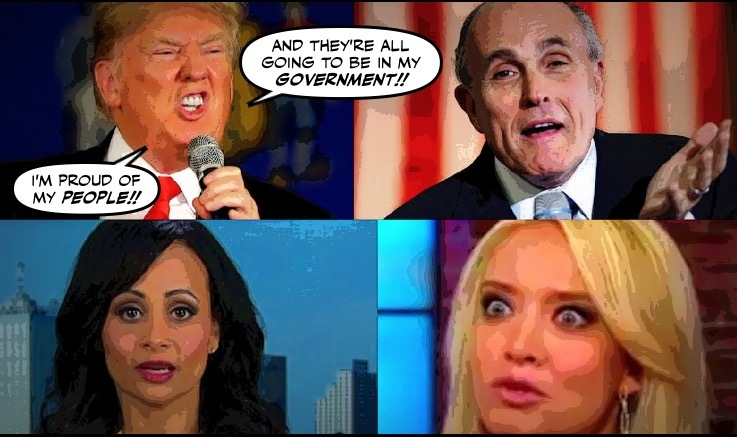 For Donald Trump and his Trumplings are still a nightmare in progress. And there was Trump yesterday, on what he called the "hollowed ground" of Gettysburg. Where the great Abraham Lincoln so famously tried to heal the wounds of a nation. I'm sure you remember Michael Sona, the young Con operative who was the only person ever convicted in the Robocall Scandal. Well now he's out of jail, talking to Michael Harris. 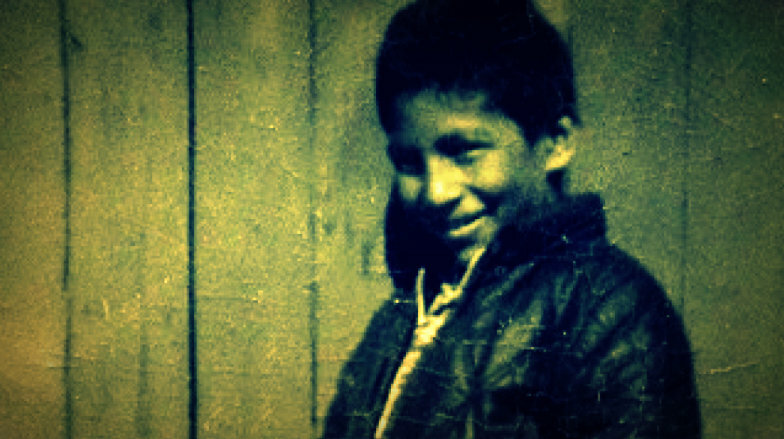 This weekend will mark the 50th anniversary of the death of Chanie Wenjack, the Ojibway boy who ran away from a residential school, only to die of hunger and exposure. The boy Gord Downie, who is also dying, has made it his last project to remember. Yesterday I celebrated the one-year anniversary of the day Justin Trudeau brought down the Con regime, after a decade of darkness. Only to be reminded how fragile was that victory. 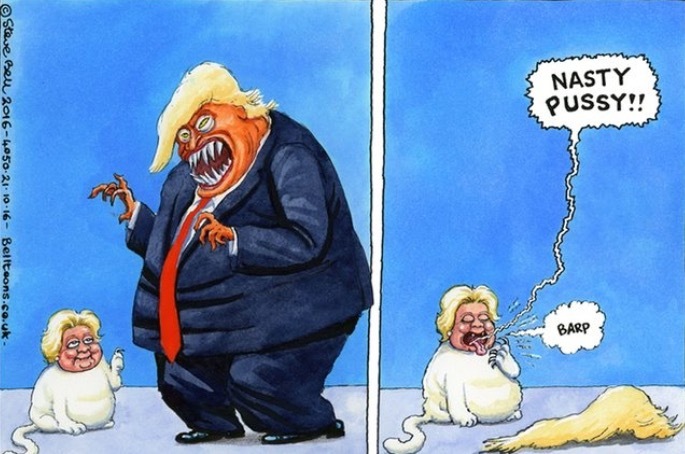 And how desperately the Con media are to return us to the nightmare we escaped. And to try to destroy Justin. 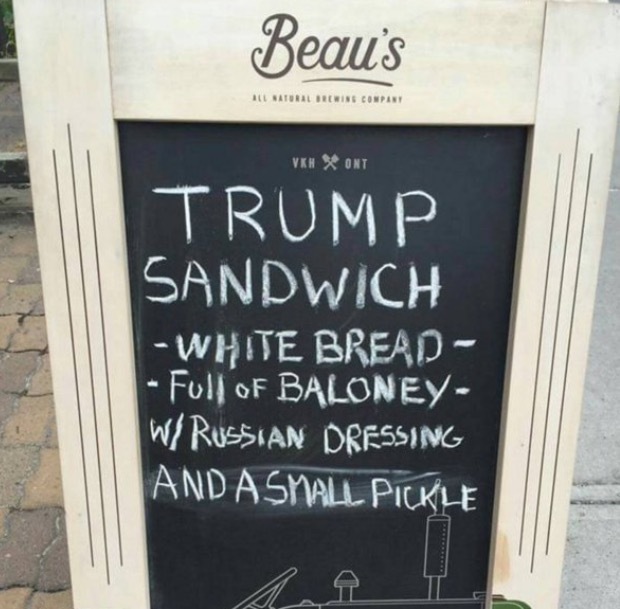 As we all know, Hillary Clinton had Donald Trump for dinner at their final debate Wednesday night. But not before he had called her a "nasty woman" and threatened not to accept the election result. For as we also know, Trump is a bad loser. But at least yesterday he made it clear what the decent people of America must do to avoid a post-election nightmare. I was so excited to see Donald Trump hit the canvas last night, that I forgot that it was also the one year anniversary of the day Stephen Harper also went down like palooka. 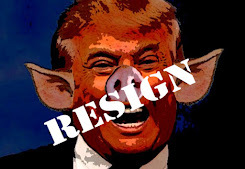 And the sun finally set on his foul Con regime. One year since Canadians finally gave them the boot. Humiliated their depraved leader. Made Justin Trudeau prime minister. 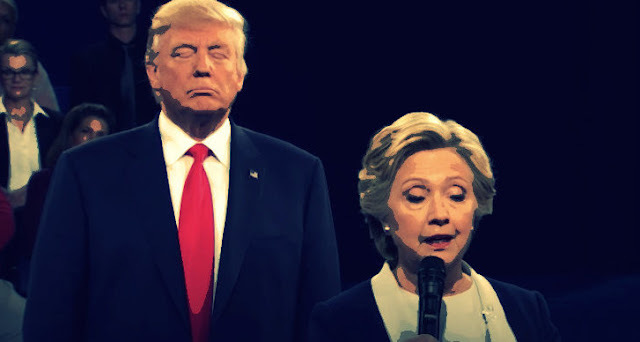 For a sickening moment during last night's debate, I thought Donald Trump was going to give Hillary Clinton a hard time, score some badly needed points. And maybe even win the debate, after losing the two others. 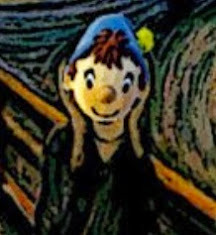 For he started out looking reasonably under control, he wasn't sniffling or snuffling, and he was talking about jobs. But sadly for him that only lasted about 30 minutes, before he hit the canvas with a sickening thud. 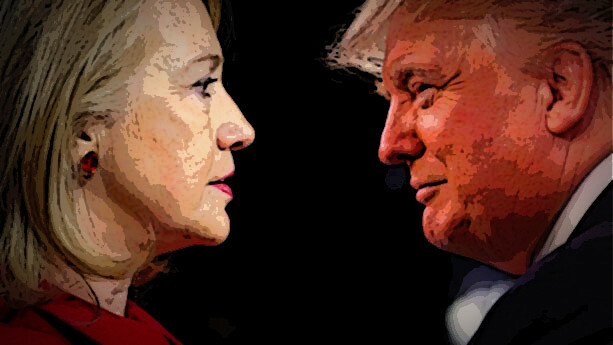 They will face each other for the last time in Las Vegas tonight, and for Donald Trump it will be his last chance to try to stop Hilary Clinton from becoming the first female president of the United States. And burying him in a landslide. It’s now or never for Donald Trump. 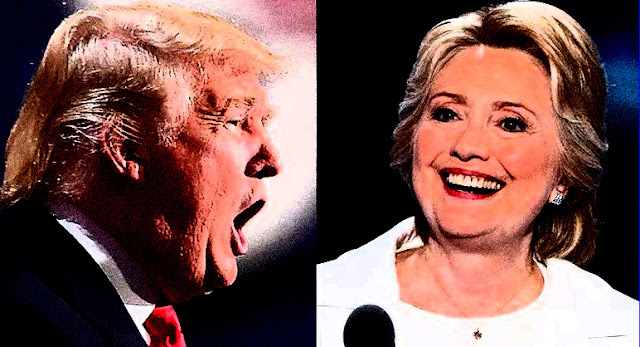 Trump now lags Hillary Clinton in the RealClearPolitics national polling average by about 7 percentage points, a margin that suggests he is in danger of being routed on Nov. 8. And Trump is no doubt hoping that Hillary Clinton's WikiLeak's e-mails will damage her enough to save him from disaster. 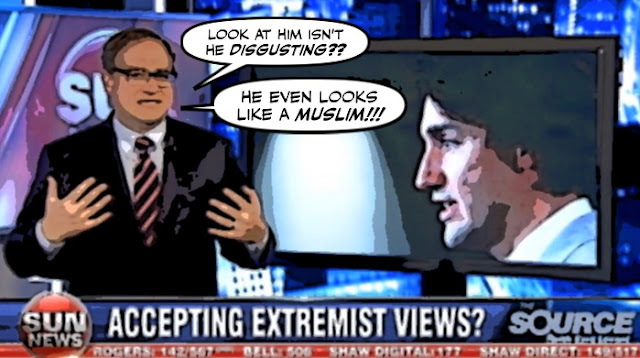 No media personality in this country has attacked Justin Trudeau as viciously as has Ezra Levant. He has called him a terrorist, he has attacked his family in the lowest possible way. During Trudeau's fight with Patrick Brazeau he got so carried away, he practically came in his pants wondering whether Justin would be removed in an ambulance or a hearse. And his ghastly Rebel has run one death threat after another aimed at him in its grotesque comment section. Like many others, I don't believe that Donald Trump ever thought he would become the Republican candidate for president, when he launched his campaign sixteen months ago. I believe that all he was interested in was getting a lot of free publicity, and boosting the Trump brand. So I thought it might be interesting to look at how that brand is doing after all that has happened and all those scandals. And as it turns out, the answer is not so good. 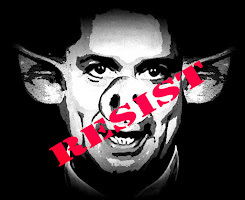 About two weeks ago I wrote a post where I said that the only thing worse than watching Donald Trump in full fury, was having to listen to his screaming surrogates on CNN. Not when Corey Lewandowski is reportedly being paid $500,000 by CNN, while apparently still working for Trump. But the worst thing about those surrogates is that not only are they incredibly annoying, CNN's decision to employ them is also a threat to American democracy. Now it really is looking like the final scene in a horror movie. With the monster Donald Trump cornered and increasingly desperate. Most decent Americans now consider him a sleazy sexual predator. Fewer people are attending his rallies. His polls are collapsing. And he's never sounded crazier, or more dangerous. 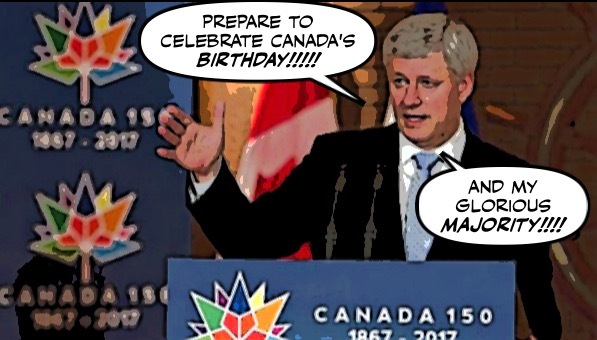 I'll always remember the day Stephen Harper decided to start celebrating Canada's 150th birthday, three years early. And how critics warned that the infrastructure money that came with it could be used by the Cons as a giant slush fund. And sure enough they were right. Yes I know, I vowed to try to tune out the Donald Trump horror movie this weekend, to remind myself that the world isn't THAT crazy. But it isn't easy. 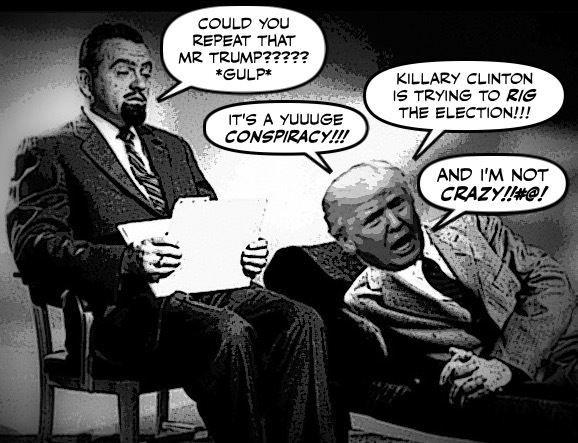 Not with the deranged demagogue now running wild, and suggesting that Hillary Clinton was on drugs during the last debate. After his sniffling, snuffling performance, that had many wondering whether he was suffering from a bad case of coke nose. So I give thanks that in the midst of this madness there are videos to distract me. Labels: Donald Trump, The Madness of Trump, The Race for the White House, The Simpsons, Will.I.Am. I want to look away, I want to escape the insanity, I want to live in our peaceful kingdom, not in some American nightmare. But I can't take my eyes off the horrifying sight of Donald Trump sounding crazier by the moment, and revealing his inner monster. For it is a horror show. It is a total meltdown. As we all know, Rona Ambrose likes to spend most of her time accusing Justin Trudeau of being a big spender. She has attacked him for employing two nannies to take care of his three young children. She has blasted him for taking his mother to Washington even though Barack Obama invited her. But now the acting Con queen is under attack herself. Judging by this sign, and what I've seen and heard in Montreal and Toronto, if Donald Trump ran for office in Canada, he'd get even less votes than the Cons, and just a few more than the Bloc Québécois. Most Canadians I've met are disgusted by that loathsome demagogue, and hate him almost as much as most Americans. And I'm sure even more of them are going to feel that way after they read what that grubby sexual predator did to a Canadian woman. 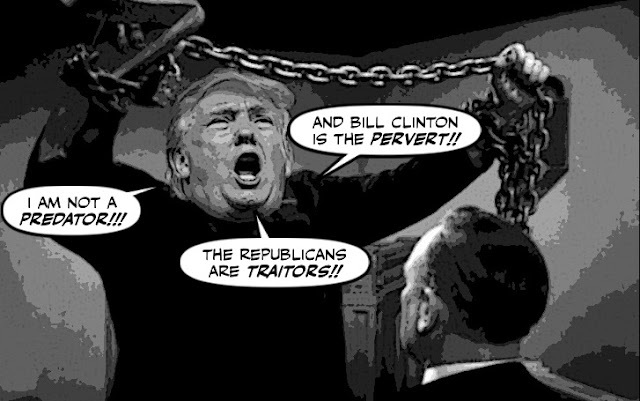 As we all know Donald Trump is now unshackled, going after the Democrats and the Republicans. And of course trying to smear Bill Clinton, even though he's not running for anything. But Trump's desperate attempts to deflect attention off his reputation as a sexual predator seems seem to be backfiring spectacularly. Because now he's been hit by another sordid scandal. 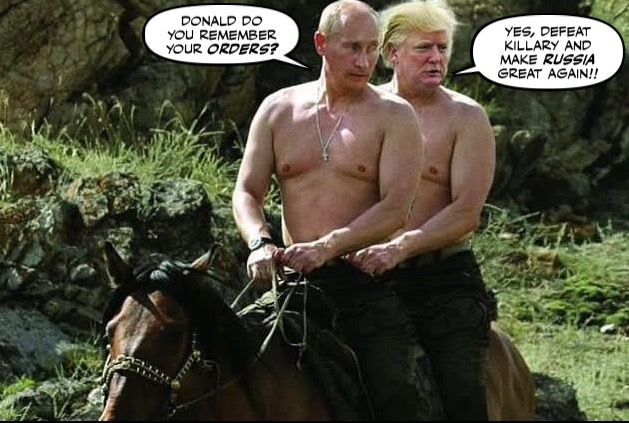 As we know Donald Trump has a cozy relationship with the Russian strongman Vladimir Putin. So cozy in fact that the Obama administration has accused the Russians of trying to influence the result of the American election. 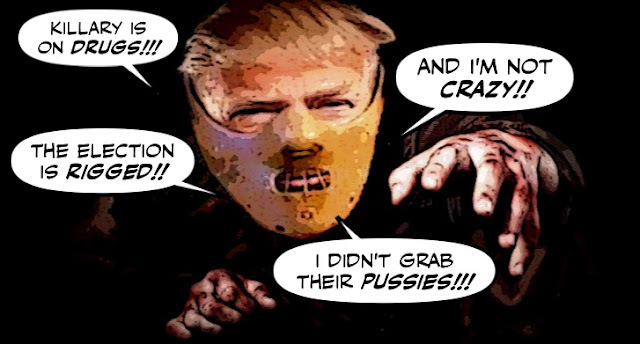 He's been slowly losing it since he lost the debate, and a tape revealed him to be vulgar, foul-mouthed misogynist who boasts about using his tiny fingers to sexually assault women. He's been staying up too late tweeting crazy things, the strain of the long campaign is getting to him. And now Donald Trump has finally gone over the deep end. And declared war on his own party. 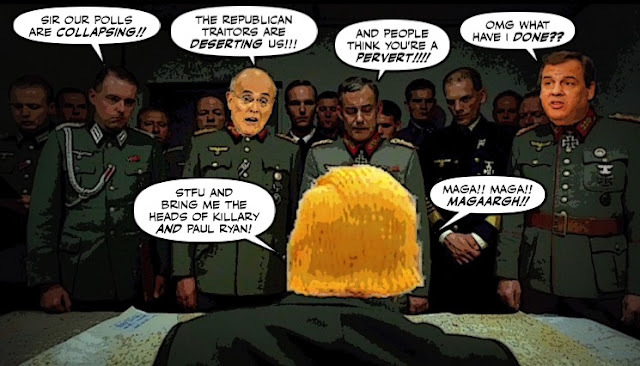 Donald Trump is said to be holed up in his bunker in the Trump Tower, surrounded only by his most faithful supporters, like Rudy Giuliani and Chris Christie, and the usual gang of neo-nazis. He's still claiming that he won the last debate. And that he's going to win the election, and Make America Great Again. MAGA!! MAGA!! But with every hour that passes the mood in the bunker grows grimmer. As we know these days Donald Trump can't say enough bad things about Hilary Clinton. 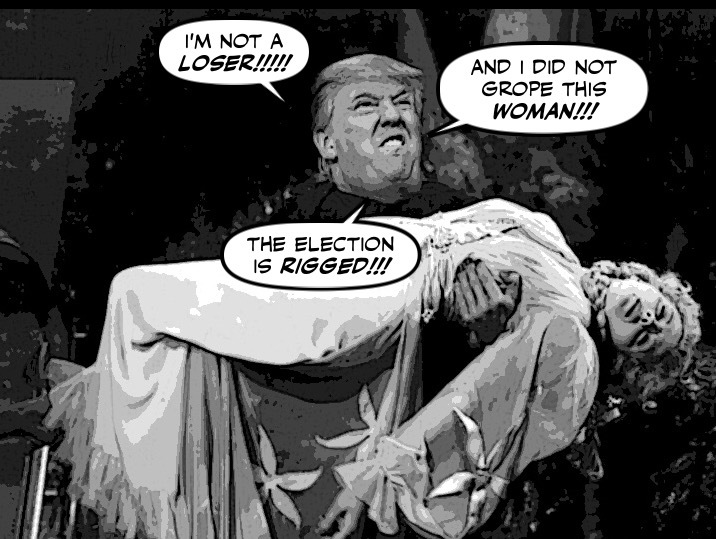 He calls her "lying, dying, and crooked Hillary" and accuses her of enabling her husband's sexual scandals. 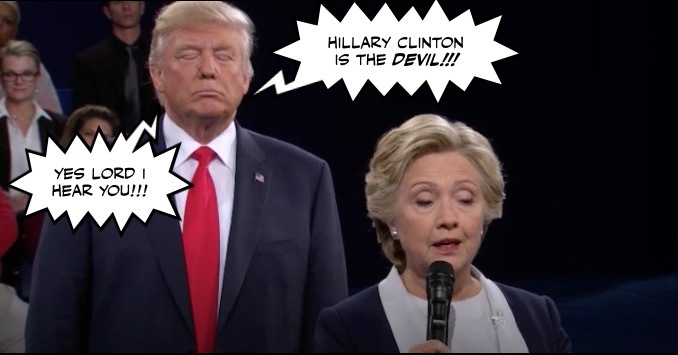 And during Sunday night's debate he called her the "devil" and vowed to jail her if he ever becomes President. But seventeen years ago when Clinton was still coping with the fallout of those scandals, Trump couldn't praise her enough. 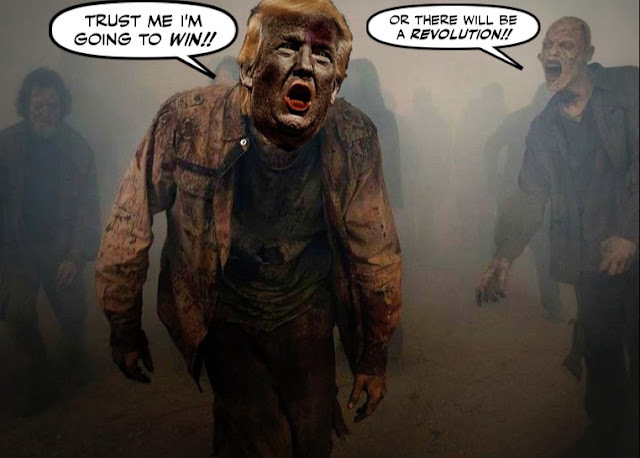 When the latest chapter in the horror show that is the U.S. presidential election was finally over last night, I was shocked to hear a CNN pundit declare that he thought Donald Trump had won the debate. Because while Hillary Clinton didn't perform as well as she did in the first one, and didn't deliver a knockout blow. I thought Trump lost the debate even before it began. 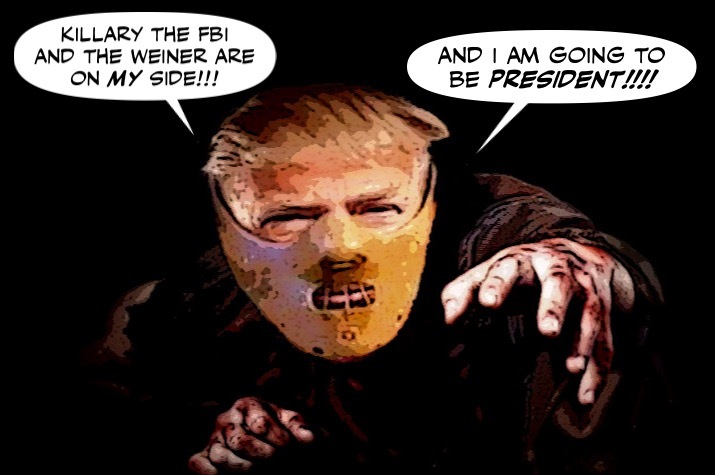 He has been holed up in his bunker in the Trump Tower slowly going crazy, or crazier. 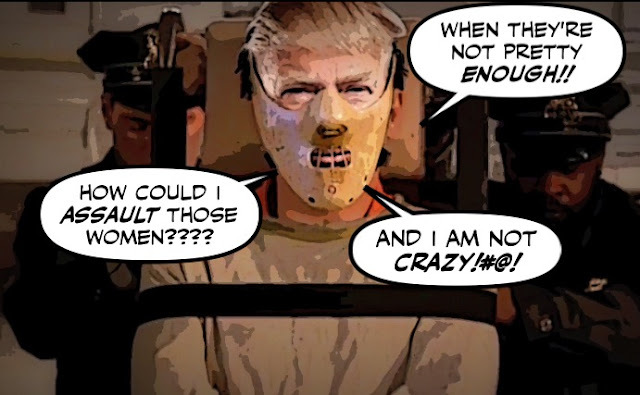 His aides say one moment he is depressed, the next moment he is delirious. 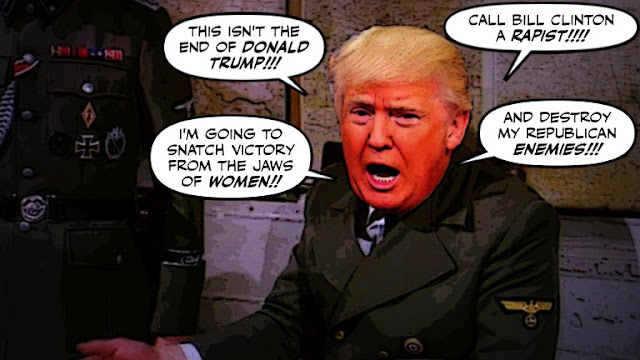 But yesterday afternoon Donald Trump finally emerged for a few brief moments, to wave to his shell shocked supporters and pump his fist in the air. After issuing a defiant statement. 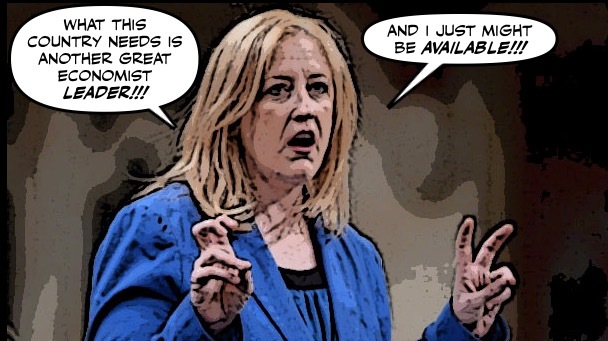 As you may have heard, the absurd Con clown Lisa Raitt is said to be preparing to enter the Con leadership race. And to try to boost her profile she's been posing as the Con's finance critic, and attacking Justin Trudeau's plans for a national carbon tax. But when she recounted the story about how of how her "friend Marie" might not be able to take one of her three boys to hockey practice because of that dastardly tax. Some in the Commons couldn't help laughing. A lot has been said or written about Donald Trump's disgusting remarks about women. And I've made my position clear. But while I like what Hillary Clinton has to say about that sexual predator. 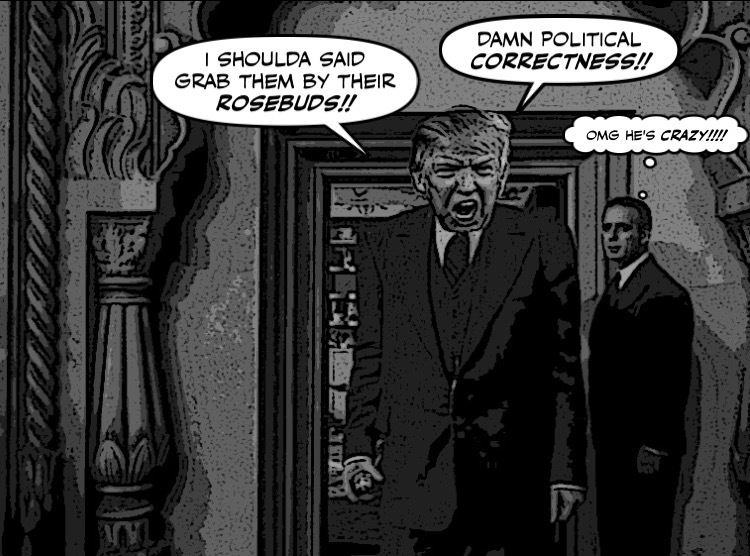 I can only imagine what the atmosphere must have been like at the Trump Tower last night. But it couldn't have been pretty. The panic, the wailing, the sheer desperation. And the old hog bellowing "I'm better than Bill Clinton, and I will make America Great Again #!!@#!!! But when shortly after midnight, Donald Trump and his Trumplings finally agreed on a statement, it couldn't have been more inadequate, or more disgusting. Has Donald Trump Just Destroyed His Own Campaign? 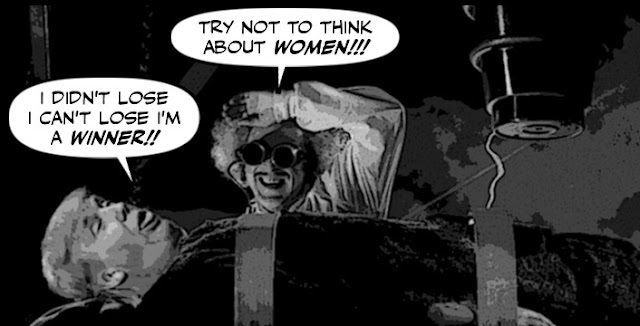 We already knew that Donald Trump was a sexist hog and a grubby misogynist. 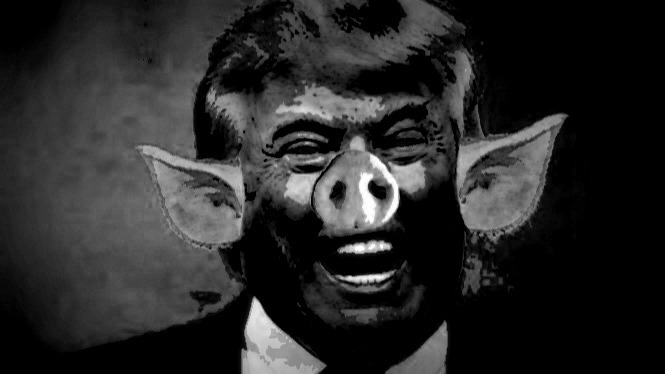 We knew he called women pigs and dogs. We knew he was a dirty old man. But this should just about finish him off. Is Donald Trump's Campaign Going Off the Rails? 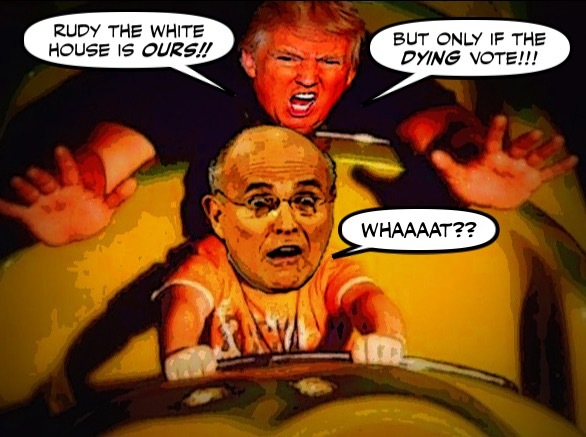 Watching Donald Trump these days is like watching a mad man riding a roller coaster, and about to fly off the rails. Because while sometimes he sounds supremely confident, brandishing one small poll after the other to make it sound like it just a matter of time before he turns the White House into the Gold House or the Trump Palace. At other times he sounds desperate. As you know I hate bullies with a passion. 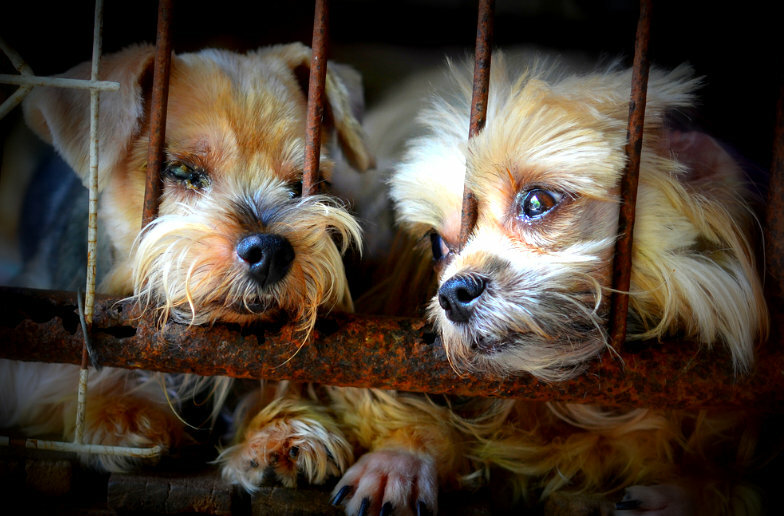 Especially those who bully children and seniors, and those who are cruel to animals. So it troubles me that although Canada likes to think of itself as an enlightened country, our laws on animal cruelty are barbarous, and haven't been updated since 1892. And a horrible accident in Ontario the other day, only reinforced my belief that it's time those laws were changed. It could only happen in Alberta, or in the battered petro-state that Stephen Harper bequeathed this country formerly known as Harperland. For on the day that our parliament endorsed the Paris Climate Change Agreement. The House of Commons voted 207 to 81 to endorse the Paris agreement on climate change tonight, after Prime Minister Justin Trudeau outlined a national carbon price plan Monday that will begin in 2018. And the Cons to their eternal shame voted against it. 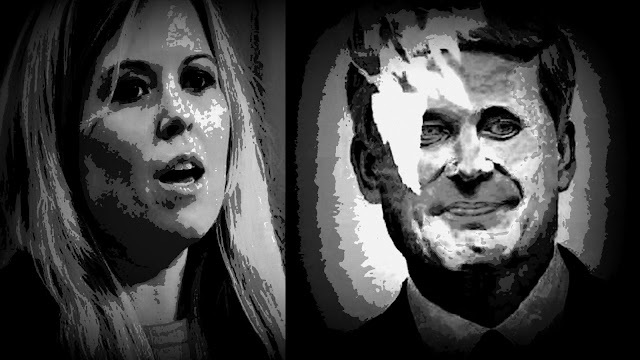 All I could hear was the buzzing sound of Michelle Rempel making an absolute fool of herself. Again. 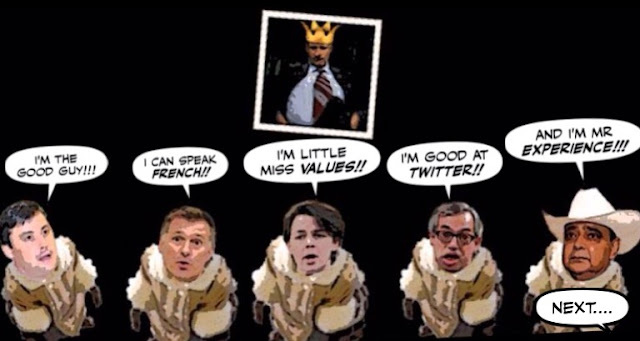 In my continuing coverage of the Con leadership race, I haven't written much about Maxime Bernier's candidacy, for obvious reasons. I didn't think the Bobo from the Beauce, as we call him in Quebec, had a snowflake's chance in hell of winning. Unless he recruited his former girlfriend's biker friends, rode through the convention hall, and scared the delegates into voting for him. Or else. But believe it or not that may be his strategy, because Bernier has just kicked up the Fear Factor a notch. 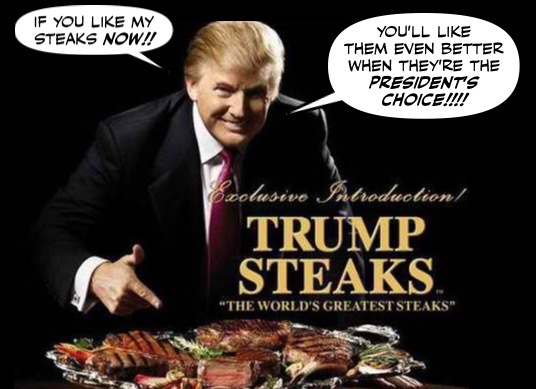 Well now that we know that Donald Trump enjoys the good things in life, but doesn't like to pay for them. 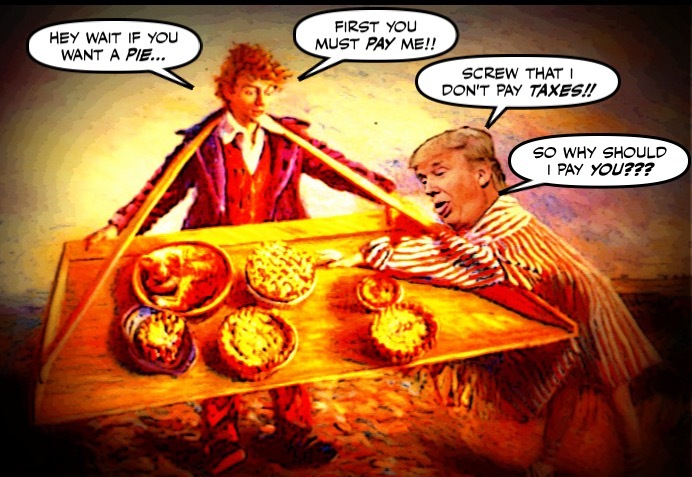 Now that we've seen how he intends to fix that problem. You might think that Rona Ambrose's main concern would be the way her allegedly new/nouveau party is turning into a collection of bigots and right-wing religious extremists. What with Kellie Leitch trying to scapegoat refugees and immigrants for their "anti-Canadian values." While Brad Trost stands up for those anti-Canadian values by taking aim at women and gay Canadians. 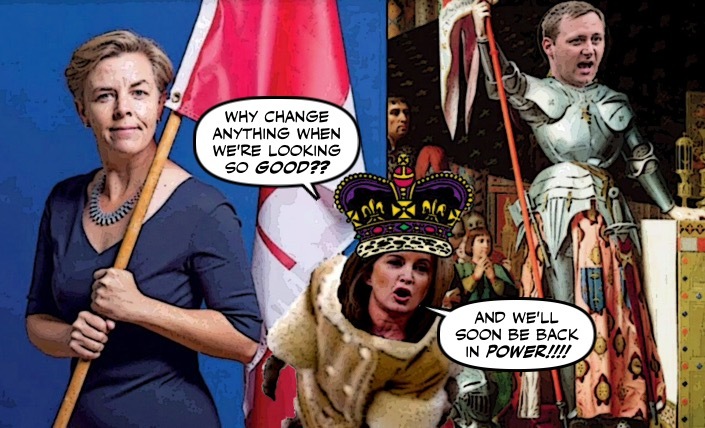 And the religious fanatic Andrew Scheer threatens to take the Harper Party even further to the right. 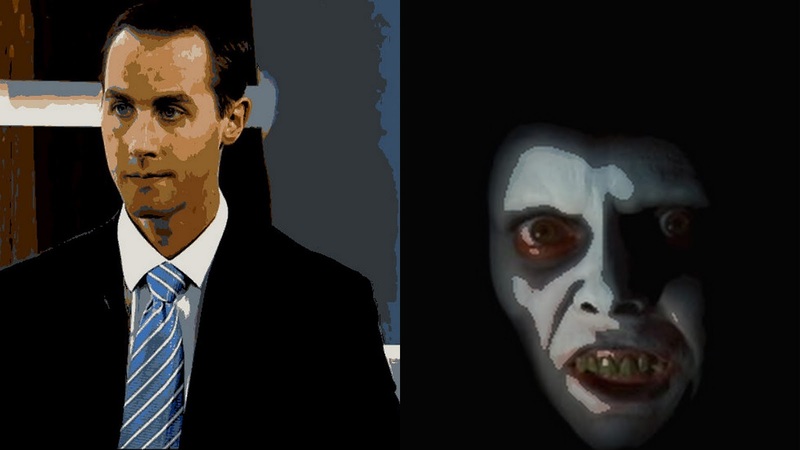 But no, the ghastly Ambrose has only one thing on her mind. Labels: Brad Trost, Electoral Referendum, Electoral Reform, Rona Ambrose, The Death of Con Canada. I didn't think Donald Trump could sink any lower after his monstrous meltdown on Twitter the other night. But then he's been in a furious frenzy since he lost the debate. He still believes he won. So there he was yesterday taking out his frustration on Hillary Clinton. By mocking her recent bout with pneumonia. There is only one thing worse than watching Donald Trump in a full orange frenzy, and that's watching his shameless so-called surrogates in action. 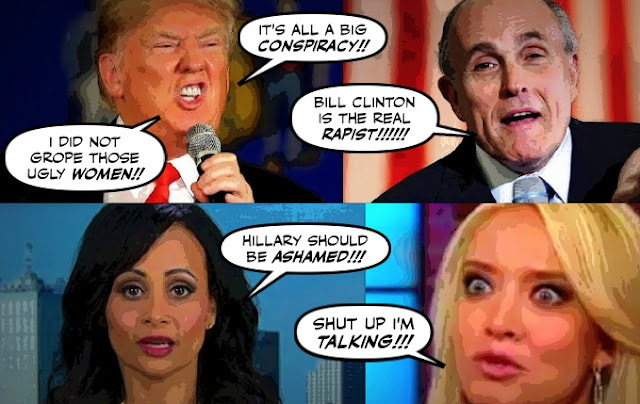 The hapless stooges Trump sends out to try to defend him, and promote the deranged idea that he's fit to be president. 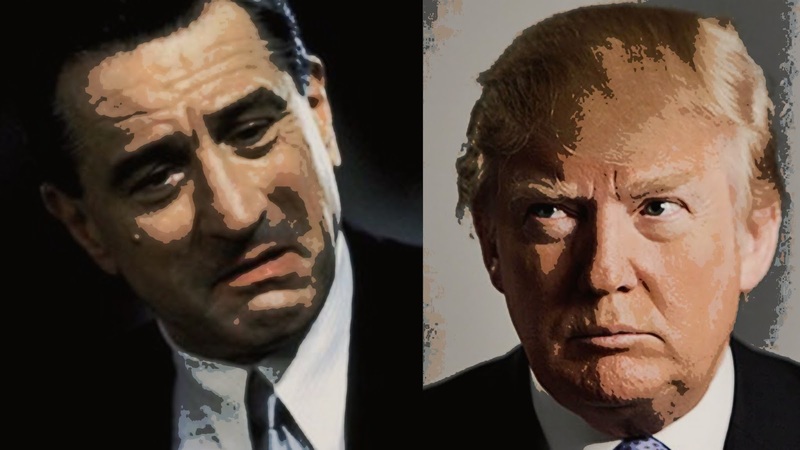 What if Trump did become President, and those Trumplings roamed the corridors of power? I knew the Con leadership race was a total bust. 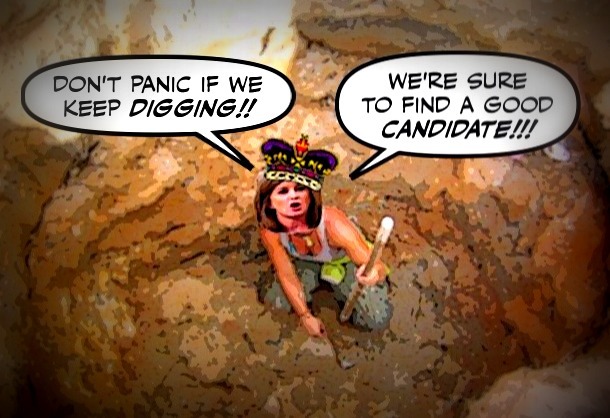 With the desperate search for a good leader continuing, but getting nowhere. 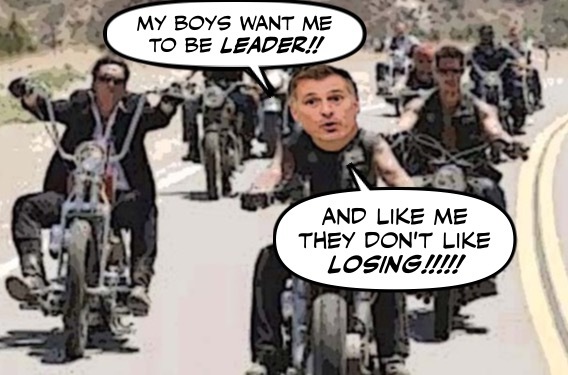 But now that the SoCon Andrew Scheer has joined the race, that's changing.